The DUROMETER SHORE A is designed to measure the penetration hardness of rubber, elastomers and other rubber like substances such as neoprene, silicone, and vinyl. It can also be used for soft plastics, felt, leather and similar materials. The DUROMETER SHORE A is built for the most rugged materials, with all parts machined to a high tolerance for precision gauge movement. All working parts are totally enclosed. Each heat-treated, high carbon steel spring is calibrated to specified tolerances. A special cam permits a scale deflection of 100 points when the indenter is displaced exactly .1". 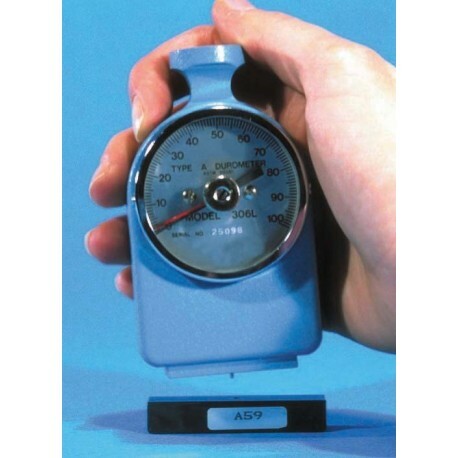 The non-glare, brushed aluminum dial scale is extended over 240 circular degrees to provide a reading accuracy well within 1% of the calibration curve. 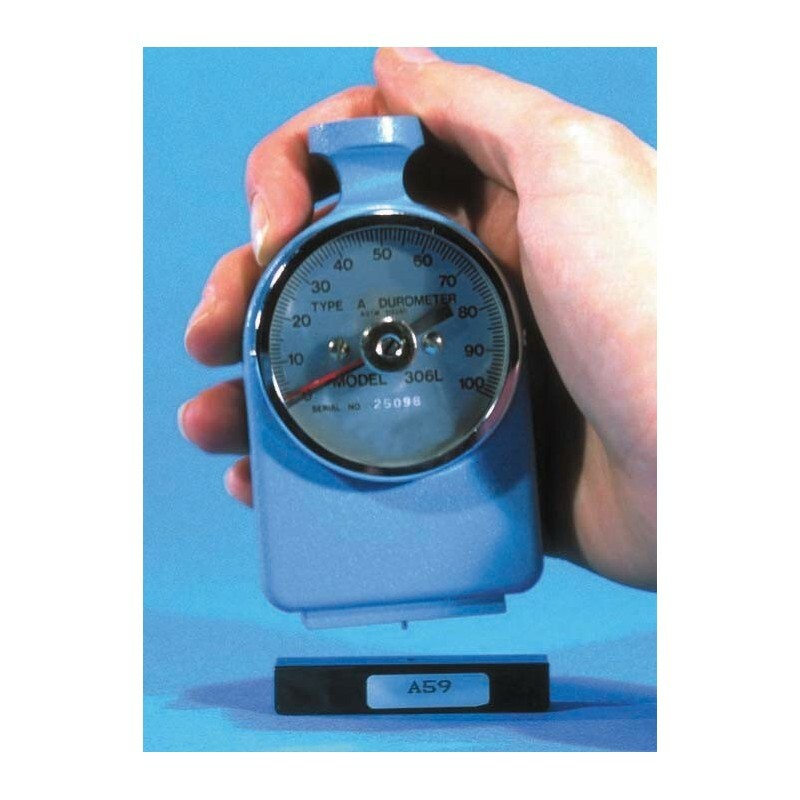 The lazy hand (ancillary pointer) is held by a magnetic clutch at the highest durometer reading and will hold this reading against all vibrations and jarring met with normal use. An 8-32 threaded mounting knob permits test stand emplacement. Each Durometer Shore A comes complete with a marked, calibrated test block made of steel (far more independent of temperature changes than a rubber block) and carrying case. The DUROMETER SHORE A may be checked for calibration in 2 ways. The indenter pin protrudes from the foot of the instrument 2.46-2.54nm (.097"-.1".) when the dial reads zero. When the pin is inserted into the hole on the test block and the Durometer Shore A is pressed down until the foot is resting on the test block, the dial reading should coincide with the number stamped on the test block. Accuracy:	Engineered precision assures high repeatability. Dependability:	Rugged construction, with all working parts totally enclosed. Simplicity:	No complicated setups required, easily used and read anywhere. Versatility:	As either portable or test stand units mounted in any orientation. Economy:	Low initial expense and long working life.